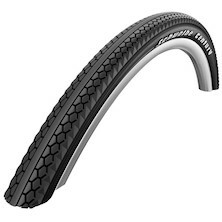 Massive closeout sale on 2012 Schwalbe tyres with up to 50% off RRP! Just in and set to fly, we've got a huge range of everything from premium top end Evo MTB models to budget busting cheap and cheerful wired tyres, puncture proof Silento and Marathon 700c tyres, Montello tubs and of course the classic Durano road tyres! All at the web's best prices- save £££'s! Here at Planet X / On-One we are massive fans of Schwalbe. Dependable, effective and durable tyres with industry leading technologies and true to application performance, there is a tyre for every eventuality.And with this clearance offer there has never been a better time to get your bikes rubbered up for the year ahead. Check out the product grid below and Buy Now! Big, tough and fast rolling, the Big Apple gives a cushioned, suspension-like feel to your riding. 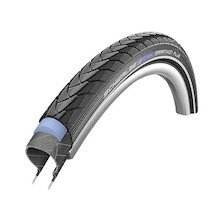 Schwalbe's Marathon Plus is their best selling tyre. 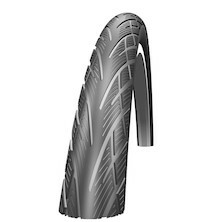 Built with a 5mm deep anti puncture strip and reinforced sidewalls it's the most puncture resistant tyre we've used. Schwalbe's new urban tyre, built for retro-modern bikes and available in a wide range of profile widths. 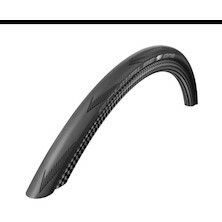 Performance line version of the Schwalbe ONE folding tyre. If you used to ride the Ultremo this is the tyre that replaced it. The exceptional profile and OneStar rubber compound make the Schwalbe X-One the most versatile and unbelievable fast cross tire ever. To make it the absolute high-flyer, mount the TL-easy version without a tube on a tubeless-compatible wheel. 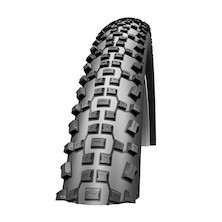 Competition XC tyre from Schwlabe in their budget Performance construction and rubber compound. 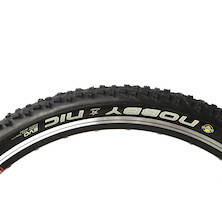 If you burn through tyres these are the ones to stock up on for the Xc season ahead. A high grip mini-spike style Cyclocross tyre from Schwalbe. Coming in at 33mm it's fine for UCI sanctioned events. A fast-rolling and comfortable tyre for commuting, the Schwalbe Big Ben MTB Tyre also features RaceGuard technology for reliable puncture protection. 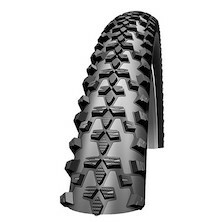 A 26" tyre with plenty of grip for technical trail riding. Triple compound rubber puts the hard rubber where you ned it to punch through for grip and softer rubber on the edge blocks so you lean it over hard to rail every corner and berm. The ideal race tyre for fast, tough courses. Tubeless compatible for great riding and puncture protection. For 100% Speed - The new X-One Speed makes the One-Cross-Series complete. A real Speed-Miracle. 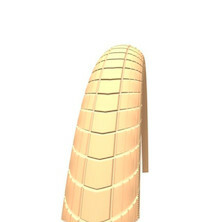 The flat round knops are supported by novel Multi-Rip- Blocks for good traction on dry tracks. Vertical side knobs give stability when cornering. Small block knobby 26" tyre from Schwalbe. Based on their Racing Ralph design The Rapid Rob hunts out the grip in the corners and rools smoothly due to the closely spaced centre knobs.